This is the last in my Halloween baking series! I reeeeally enjoyed coming up with each of these bakes and planning them out in my head, and I think I saved the best til last. These are absolutely scrumptious and really simple to make. These are my Cookies 'n' Cream Cobwebs, which are a light and fluffy cupcake, topped with Oreo and white chocolate buttercream, and a hand piped white chocolate cobweb. The overall effect of these is pretty great, if I do say so myself, and everyone has been rather impressed. So if you're looking for an easy way to make a statement this Halloween, these are definitely the way to go. If you like a cupcake with a good rise, this recipe makes about 9 cupcakes, but if you aren't too fussed about having some that are shallow, you can do 12! If your mixture seems a little runny, don't worry, it's meant to be like that. Due to all the liquid in this mixture, the consistency isn't like other cakes. But that means you can pour it into your cases instead of scooping it! If you've got a sweet tooth, you're going to die over this icing. With a full pack of Oreos and 120g of Milky Bar, it really is a chocolate lovers dream come true. It's super smooth and creamy, and it just melts in the mouth. Even if you don't use it on these cupcakes, this is definitely an icing recipe to save in case you want to use it for something else! Preheat your oven to 170c/gas mark 3. In a large bowl, cream together 40g of unsalted butter with the caster sugar until well combined. It will look a little sand-like at first, but just keep going with it and it'll come together. In a jug, whisk together the milk, eggs and vanilla extract. Gradually add it into your sugar-butter mixture, beating between each addition until smooth. This will make your mixture quite runny, but don't worry! Sieve in your flour, cocoa powder, baking powder and salt, and then fold into your mixture. You should have lots of little air bubbles popping up, which shows that your cakes will be gorgeously soft and light. Pour your mixture into your cases and bake for around 20-25 minutes or until a skewer comes out clean. Once done, remove them from the oven and allow them to slightly cool in the tin before turning out on to a cooling rack. 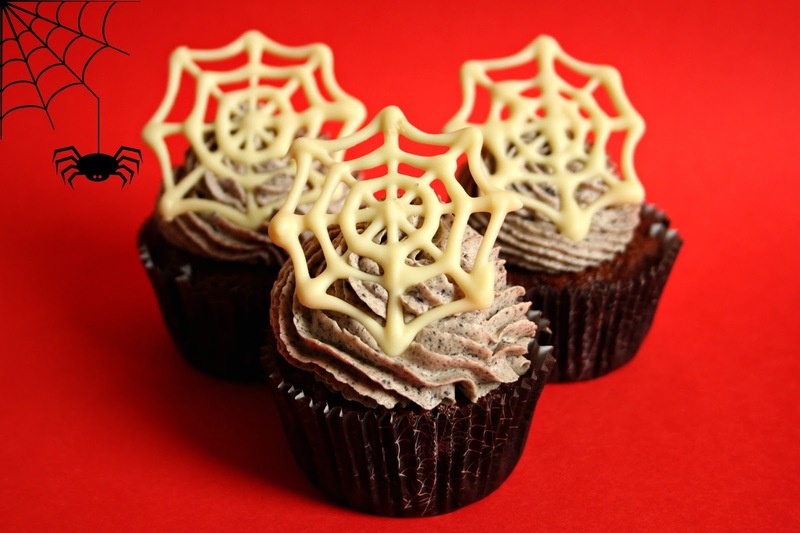 Whilst your cakes are in the oven, you can make your cobwebs! Place a heatproof bowl over a pan of simmering water, and break a 120g bar of Milky Bar into it. While your chocolate melts, draw some cobwebs on to greaseproof paper with a Sharpie pen. Turn your paper over and place on to a plate or baking tray, and then using a piping bag and a nozzle with a small hole, pipe your melted chocolate over your drawings. This may take a few practise runs, but you'll get the hang of it! You also might need to do a few more than needed, as some may break when removing them from the paper. Once done, pop them in the fridge to set. You should leave them in for 10 minutes minimum. To make the icing, beat your remaining 250g butter in a large bowl to soften it up. Gradually add in the icing sugar until it is all combined. Whizz your Oreos in a food processor until they turn into crumbs and tip them into the icing mixture. Beat again to combine. Melt your other bar of white chocolate in a heatproof bowl over a pan of simmering water, and then gradually add it in to your icing. Don't dump it in all at once, otherwise it will melt your butter and ruin your icing. It should end beautifully creamy and smooth. Now it's time to put your cakes together! Pipe your icing on to your cakes with your favourite nozzle, and gently stick one of your cobwebs on top. They will be super delicate so take care when peeling them off the paper! And you're all done! Of course, if you don't fancy fiddling around with making chocolate cobwebs, you could just decorate with some sprinkles or Halloween treats. However you choose to decorate, these cakes are guaranteed to please. They're absolutely delicious and so fluffy! I'm going to really miss doing Halloween bakes, but I'm so looking forward to planning my Christmas ones. Stay tuned!